The show started off with the very handsome 26-year-old Ben Higgins visiting his hometown of Warsaw, Indiana. He talked about how he had his first date at a movie theater where the most beautiful girl in the world to him, at the time, gave him his first kiss and also crushed him by breaking his heart! Aww! He also went back to his old high school where they held a pep rally for him and it seems like he's got a lot of support. Ben talked about his fear of being "unlovable" and how he longs to find someone that he can say "I love you" to and that she will say it back. His parents have been married for more than 30 years and he wants to find that same kind of love. His parents tried to talk some sense into him about the whole "unlovable" thing and said that when he finds the right woman, that won't be a fear anymore. They seem like such a sincere, nice, loving family! Any woman would be fortunate to be their daughter-in-law! 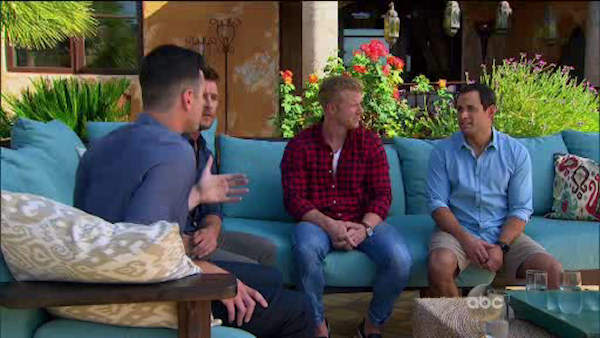 Sean Lowe, Jason Mesnick, and Chris Soules came to give Ben some advice. Really? Chris Soules did not have a great outcome! I wouldn't really take any advice from him sadly. They talked to him about how he should focus on each girl individually and to just let the kisses come as they may. Sean talked about how he didn't even have serious feelings about Catherine until halfway through, so he should try to give everyone an open-minded shot. I wonder what Catherine thinks of that! Jason even said that although he changed his mind in the end from Melissa to Molly, it was the right decision and it was a decision that had to be made, so Ben should be prepared to make some tough decisions. Hopefully Ben won't make that big of a blunder and he will choose wisely the first time around! Ben drove off in a limo ready for night one at Bachelor Mansion! But before we could see the ladies emerge from the limos, we got to see a snippet of a few of their lives back home. First up was Lauren B. She's a flight attendant who is sick of being single! She's cute and seems like fun. Caila is a sales rep who talked about how she had doubts about her boyfriend while watching Kaitlyn's season and seeing Ben. So this semi-stalker broke up with her boyfriend and now says that she can't wait to meet Ben. Isn't that a bit creepy? Jubilee is a tough military woman. She's even served in Afghanistan, but now she's on a mission to win Ben's heart. She says that she hasn't had a chance to date since returning from active duty. Can I just mention, wow, this woman is drop dead gorgeous! They were sure to show lots of shots of her on the beach. 28-year-old Mandy is super weird. She's a dentist and she seems to delight a little too much in inflicting pain. She said that she would never date a guy with gingivitis and she plans to give Ben and oral exam to make sure he flosses. Emily and Hailey are twins who seem like they love each other a lot and love to have fun. It's a bit odd they are after the same guy. I wonder if they even have the same type normally! Amanda is 25 from the OC and she's an esthetician for a skin care company. She's a single mom who is divorced and has two daughters. One is 3.5 and the other is 2. That's a handful! She says she's going on the show for them...ok. I don't really get it, but it does seem like a fun getaway - if she likes catfights. Tara is 27 and a chicken enthusiast. She says the chickens are her babies. Wow. She loves Sheila the chicken and she even stays in her room with her. She had picture frames of her chickens with Ben in the middle sitting in her apartment. I can't wait to see what Ben thinks of her. Sam is 26 and from Florida. She recently graduated from law school. Her dad was diagnosed with ALS when she was in high school. She says she was just 13 when he passed away. She's ready years later to get over her grief and try to find a husband. She of course hopes that it is Ben! Then it was limo time at last! The ladies were locked and loaded and full of champagne. Chris Harrison greeted Ben, and Ben looked great! After a quick greeting, the first limo pulled up. First out was 25-year-old Lauren B. She told him that she was nervous and he said that he was too. She brought him a pair of wings and she told him to keep them on him at all times. It was sweet. I like her! Ben commented that it was a great start. 24-year-old Caila was next and she jumped into his arms and asked him if she could catch up with him inside. Cheesy! 25-year-old Jennifer came out next and Ben told her that she was stunning. She forgot to tell him her name! 23-year-old Jami was out next and Ben said "Hello, beautiful"! She's a Canadian and she learned from a past contestant that he has a really, really, really big heart. Samantha, 26, was out next and she told him that on the way there she just learned that she passed the bar exam. She asked him "Boxers or legal briefs?" He said legal briefs! 24-year-old badass Jubilee emerged and she said that she wanted to do a pickup line on him, and it was pretty sweet. Ben said that he liked it and she said there was more if he wanted. 25-year-old single mom Amanda was out next and she told him that she was excited it was him. 25-year-old Lace followed and she laid a kiss on him and said that she wanted the first kiss! He complimented her dress and seemed shocked that she did that. 26-year-old Lauren R. told him that she's stalked him over social media over the past few months. She also forgot to tell him her name and just walked away. He said she was gorgeous but didn't know her name. He told 27-year-old Suhshanna that she looked like a rose and she spoke in another language (Russian?) to him, and asked for a rose. It was a bit confusing for him! Another limo arrived and 25-year-old Lean showed up. She pulled up her dress through her legs in a rather unflattering way and hiked a football at him. Then a woman in a unicorn head showed up and 24-year-old Jojo was inside. He said that was totally normal. 25-year-old Lauren H. exited and she threw him an old bridal bouquet that she had caught last weekend. It was a little gross looking by this point. He was surprised they still smelled good. 24-year-old Laura who is an Emma Stone lookalike told him that her nickname is "Red Velvet". 28-year-old Mandi came out with a GIANT rose on her head. She told him if things went well he could pollinate it later! The other women were shocked by her and her big rose! Next out were the twins, Hailey and Emily! Ben offered them a group hug and then they introduced themselves to him. They said they would talk to him together and individually inside. Then Maegan, who is a mature 30 years old, walked in with her pony Huey. She's a cowgirl and she does trail rides for a living. She even brought the horse inside! 30-year-old Breanne walked up with a picnic basket and so she gave him a basket of bread to break because "gluten is evil". 24-year-old Izzy showed up in her pajamas because she wanted to know if he was the "onsie" for her. Rachel an unemployed woman rode in on a hoverboard. Too bad it didn't blow up! Side note, I LOVE Lace and her assessment of the women so far, it even gets better as she drinks more. The other women hate her already. 23-year-old Jessica was out next and she said that she was so happy to be there and Ben thought she was a "sweetheart". 26-year-old Tiara gave Ben a hug and they took some deep breaths together. He told her twice how beautiful she looked. 23-year-old Lauren "LB" told him that she was excited he was there and that it was a big step. 23-year-old Jackie giggled when she got out and she gave him a save-the-date card and hoped that they might need it later. 23-year-old Olivia, a news anchor, apparently gave up her job for this! She asked him if he had dimples and showed him hers as well. Chris Harrison came out and asked him how he was doing so far. 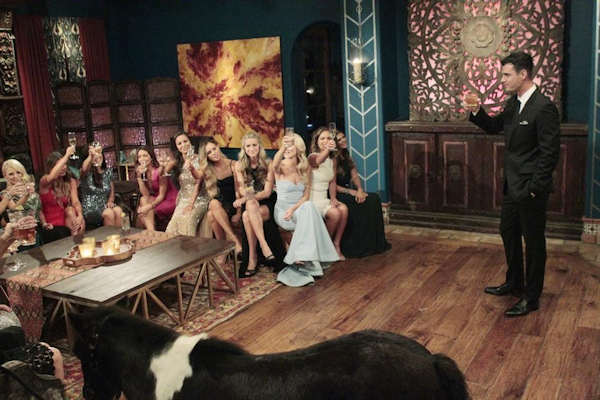 There are 26 women and he told Chris Harrison that it is very possible that his wife is in that room of women. Before he went into the room, he called his dad and his mom to tell them that the women were amazing who were there and that he thinks that they are stunning. How sweet is he to call his parents?! Then he walked in to a big round of applause and grabbed a drink from the ladies. He thanked all of them for coming and he said that he's more confident than ever after meeting them that his wife is there. Mandy jumped right in and said she was going to steal him in the middle of his speech! She asked him if he flosses and she laid him over her lap and gave him an exam! She thinks he might need to work on his flossing a bit. Olivia told him that she walked away from her news anchoring job to be there to meet him. That's insane. She's blowing her career! Maybe she just wants to be an entertainment reporter. Ben thought she made an amazing first impression. Ciara told him about how they are both in software sales and they seemed to have a lot in common. The twins told him that it wasn't weird because there are 26 women there anyway. Then, he did some kind of Pictionary type game with the unicorn girl, Jojo. The football girl still ran around and threw the ball with him. He was relieved that he remembered some of their names (even if I can't seem to). Then another limo pulled up! Guess who?! It was Becca and Amber from Chris Soules' season. 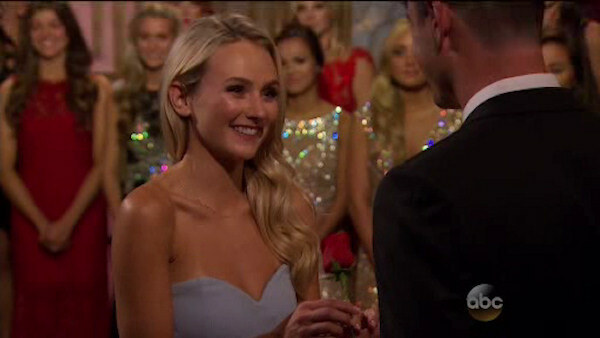 Becca was the runner up and Amber you might remember from "Bachelor in Paradise". OH and in case you forgot, Becca is a virgin. I'm sure we will be reminded of that about a million more times. As soon as they walked in, the other women gave them dagger eyes. The women were not thrilled of course that they were there. Lots of women thought it was unfair that Ben would know who they were right off the bat, but that's assuming he paid attention to those past seasons. Becca approached first and Ben was so caught off guard. Lace was very drunk and she asked for another wine glass as she spied on them talking. They seemed to have a good chat as they held hands and Lace said "oh they are getting touchy" a bunch of times. Then Amber walked in! Ben was doubly surprised and said it was "getting interesting". He asked if anyone else was coming, but they assured him that they were the last to arrive. Lace finally got her chance to talk to Ben and her plan was to get a second kiss. She asked him and he said they could do a better kiss, but he said he wants to get to know everyone before he gets sucked up in the "physical part of the night" and he wanted to take time to talk. Mandy pulled him away and Lace called her an expletive. When Mandy came back, Lace went looking for Mandy in the main room. But, before she could find him, Ben went looking for Lace! He told her that he knows it is a different experience for her and him too and he thinks that she is absolutely gorgeous and he just added that he really does want to get to know her. He said the last thing he wanted was for her to feel rejected. So now Lace feels really special. She is special...and crazy. Chris Harrison dropped off a little platter with the first impression rose and things got serious. Who will Ben give it to? There was a mad dash to talk to Ben all of a sudden! Lauren B. sat down to talk with Ben and she told him how he takes her breath away. He told her that he even said, "Wow this is a really good start to the night." He said that he thinks the ladies there are all way out of his league but he hopes he can pick one before they figure it out. He talked to Jennifer in the dark outside about their shared beliefs. Ben got up and picked up the first impression rose and walked away from the big room full of women and took it to Olivia the news anchor! Wow, I'm surprised that she is his favorite off the bat, but he really did like her and did mention that she made a great first impression! He told her that she stood out to him and he asked her if she would accept the rose and she said, "Yes!" He walked Olivia back in and Ben asked the group if he could sit down with them for a minute. The other ladies were all so jealous. Ben told them all that they were so gorgeous and as he was talking, Chris Harrison walked in to steal Ben away to deliberate on who he would keep around. Lace was mad that while he was talking to everyone he didn't look at her once in the eye. There were a lot of people there! What does she expect!? So, crazy Lace got the last rose. The other ladies said their goodbyes, including Meagan, our friend with the pony. Other notables walking away included Red Velvet and the bread breaker. Do you notice the lighting; I think the rose ceremony went on so long that the sun was coming up. After the champagne toast, Lace told Ben that she needed to talk to him. She told Ben that she thought he didn't look at her once during "the whole thing" and she started saying that she hoped it was the right thing for her and that she is "questioning it". Ben said that it wasn't on purpose and he asked her to stay because he liked her. Ben, welcome to the drama! The show ended with a preview of the season. It started with all of the ladies saying what a dream come true Ben is for them. It seems that a lot of the ladies drop the L-bomb on Ben pretty early on. One of the girls apparently gets a black eye from Lace. Also, the twins get antsy for Ben to pick between them. Then there was a lot of crying shown, even from Ben! 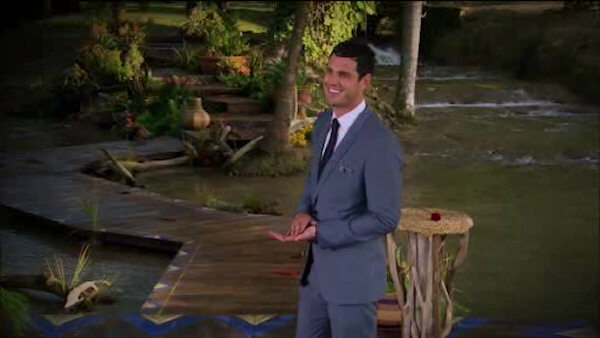 Lastly, we see Ben standing there smiling in the finale with the final rose, so let's hope he finds his true love! 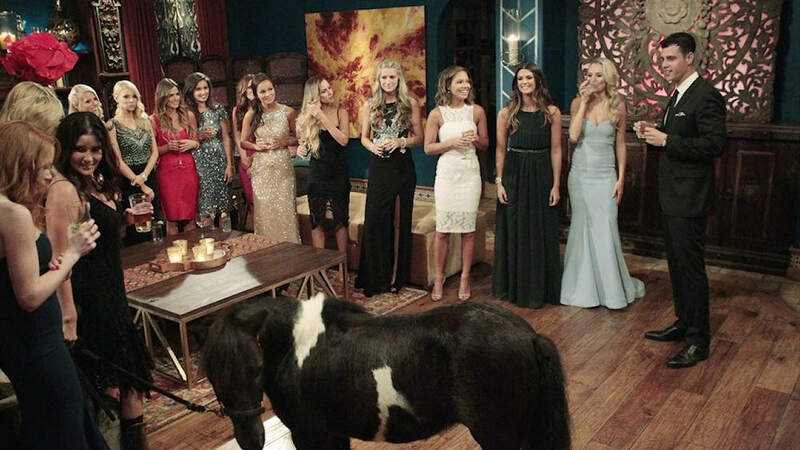 After the show, "Bachelor Live" premiered and Chris Harrison and some celebrity guests rehashed the show. Ben came out on stage to talk to the guests and he talked about what a crazy, amazing day he had. He said that he tried to be himself as much as possible. Abigail Breslin ("Little Miss Sunshine") asked him why he called the women "young ladies" so much. He said that he's just a little awkward that way. Whitney Bischoff (so clearly over Chris Soules) called in to the show to talk about some medical program she's launching with the clinic she works at. Whitney also said that she's dating someone new and she's looking forward to a great year ahead. Check out her Instagram post above! Finally, Kaitlyn and Shawn came out on the show. They talked about how they gave Ben whatever advice they could before the season started. As for the happy couple, they are still happily together. They still haven't selected a wedding date, Kaitlyn said that the show was really rushed and they want to take their time. She's not drinking because she's staying sober for January, she's not pregnant! So put that rumor to bed! When Ben was asked if you can really form a meaningful connection on night one, he pointed at Kaitlyn and Shawn!